Teaching, learning, and assessing as defined by ISTE Standard 2 is the actual practice of incorporating technology and the resources for teachers.This leadership can be seen through lesson pedagogy, content, and the learning environment. Although teachers often focus on differentiation of teaching, differentiation of assessment is equally important. All students must have the opportunity to have different assessments measuring the learning appropriate for them. I believe that project-based work provides students with the opportunity to not only learn, but then have an actual product to share. In the following lesson I had mixed reviews from different parties. Some said it was not standards based or did not stick to the curriculum, others said they hadn’t seen the students that engaged and they had hoped their school would move in that direction. Personally, I believe the students enjoyed the work and the outcomes demonstrated their achievements. This is my third year creating lessons of this type in a gentle-breeze fashion so my bag of tricks is pretty full at the moment, but I hope to begin creating these lessons in a way that other teachers can follow them if they so choose. 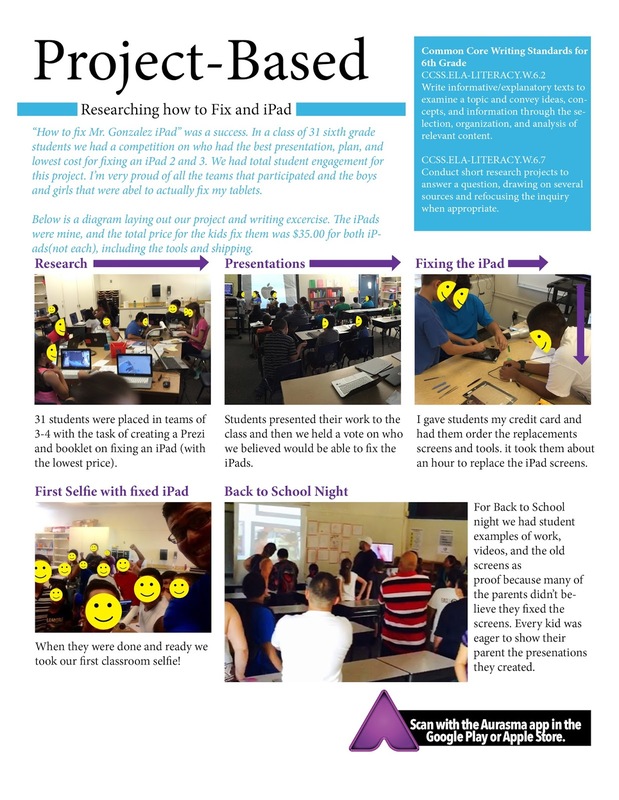 iPad fixing tool descriptions, invoice creation, and repair guides created by students. The effect of lessons such as these on teachers and administration are fleeting, like a flash in the pan, but for kids they last a very long time. One of my former principals told me “it disappears, you need to figure out how to save it.” My goal is not only to save it, but also spread it. So the following image is part of a newsletter/magazine I have been working on to save and share the tools and outcomes of the lessons. I would like to continue studying after my masters program and apply for doctorate programs in education. I would like to at some point be in a leadership position where I can help advocate for students to be active creators rather than passive consumers. Students don’t have to wait until they are 18 to begin “life,” they can start actively being a part of the world as soon as they are ready.